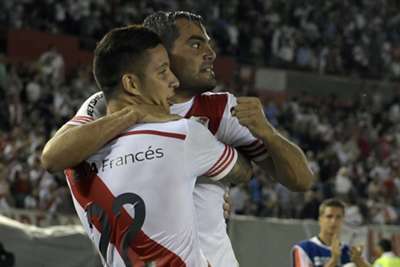 River Plate set up an all-Argentine Copa Sudamericana quarter-final after easing past 10-man Libertad 2-0 on Wednesday. Libertad striker Antonio Bareiro was shown a red card by referee Jose Buitrago in the 23rd minute and River took full advantage. Full-back Gabriel Mercado made the breakthrough in the 43rd minute before Giovanni Simeone came off the bench and completed the scoring in the second minute of injury time as River claimed a 5-1 aggregate victory over the Paraguayans. Libertad were always up against it in Buenos Aires, attempting to overturn a two-goal deficit, and their slim hopes of progressing to the last eight received a blow midway through the first half. Bareiro was dismissed for violent conduct on River midfielder Ariel Rojas. River made the most of their numerical advantage two minutes before half-time through Mercado. The home side netted a second goal in injury time, with substitute Simeone getting in behind two defenders and firing the ball beyond Libertad goalkeeper Rodrigo Munoz. River will play Argentine Primera Division rivals Estudiantes in the quarters following Hilario Navarro’s penalty heroics. The tie was sent to penalties in Montevideo after Penarol’s 2-1 second-leg win left the tie level 3-3 on aggregate. And up stepped Estudiantes keeper Navarro, who saved three spot-kicks to give the visitors a 3-1 win on penalties. Earlier, Gonzalo Viera headed home Antonio Pacheco’s set-piece in the 23rd minute. Jonathan Rodriguez put Penarol ahead on aggregate after weaving his way past his opponent on the stroke of half-time. But Estudiantes ensured the tie would be decided on penalties, when Guido Carrillo scored from long range with 18 minutes remaining.